Over the last few years, Clay and I have really nailed down our camping routine. We use storage bins to organize all our gear for easy packing, set up and breakdown. 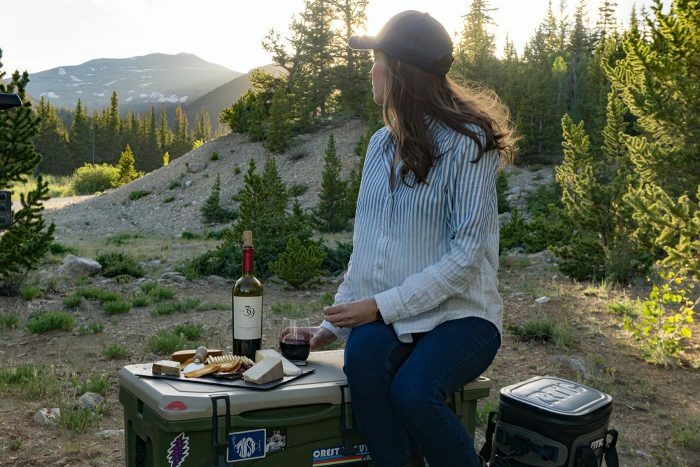 These bins plus our cooler have everything we need for the perfect car camping experience. Trust me, we aren’t roughing it, we like to camp in comfort! Wine opener? Check! A colorful powder that turns your fire into a light show? Check! Glow in the dark bocce set? Check! Once we reach our destination it’s time to make camp. Clay and I split the duties of setting up our new home. Clay pitches the tent and I blow up up the air mattress and roll out sleeping bags. While Clay prepares dinner on the grill, I prepare happy hour! 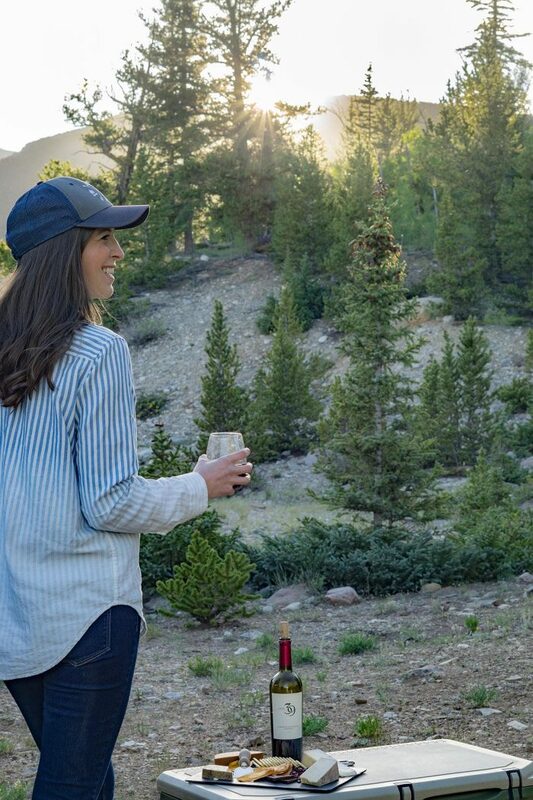 The four tenets of our success are all about creating a “luxury” camping experience. Finding the perfect car camping site is essential to a great camping trip. While designated campgrounds do have great amenities like bathrooms, showers and running water, the trade-off is the close proximity to other families, animals, and vehicles moving at all hours. Don’t get me wrong, some designated camp spots are incredible but the majority of ones we drive through are packed and often set in a wooded area with no view. We prefer dispersed camping so we can have the place to ourselves. Dispersed camping can be found where the blacktop ends and the wilderness begins allowing you to design your own dream campsite. Camping for two? Invest in an easy-up tent that sleeps at least four people, so you can inflate a full-size air mattress and have room for your bags and a dog or two. If we have room we like to pack sheets, blankets, and pillows for a super cozy night’s sleep. Always, always, always bring a back up sleeping surface. We learned the hard way after our air mattress popped in the night and we attempted to sleep on piles of clothes to keep warm. So now, we always pack our individual sleeping pads in addition to our air mattress, just in case. Also, pack an eye mask – the sun will be up way before you want to be, so eye masks are key! If I could spend every night drinking wine and eating cheese watching the sunset I would. #lifegoals When we are looking for our campsite we want that big spot with a view specifically for the happy hour sunset! “Channing and the Cheese Plate” started on a camping trip a few years ago when I was craving something extra yummy for dinner. I was tired of hot dogs and beer; I wanted wine and cheese! 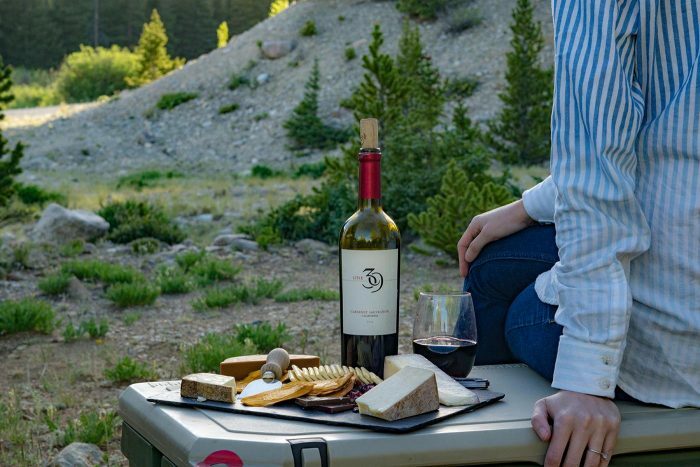 The secret to enjoying a cheese plate while camping is knowing how to find good wine and cheese everywhere you go. I like to call my cheese plates “accessible” because you can find any of these yummy cheeses in any grocery store across the country. Aged Gouda (not smoked) is going to be a winner! Stay away from the cheap Brie and opt for dried fruit, dark chocolate, fig jam and crackers to round out your cheese plate. When you’re on the road to adventure chances of passing a wine shop are slim. 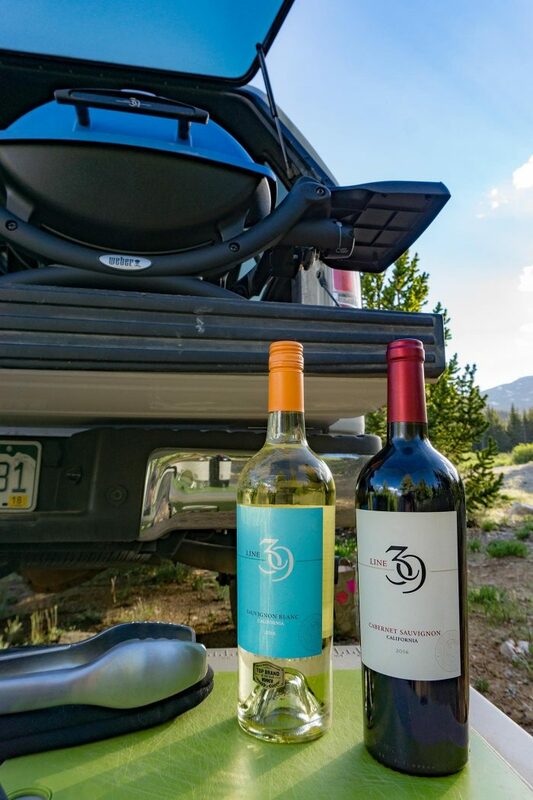 That’s just one of the reasons why I love Line 39 Wines, you can find them virtually all over Colorado, making them my “go-to” adventure wine and at around $11 (or less) a bottle, they won’t break the bank either. 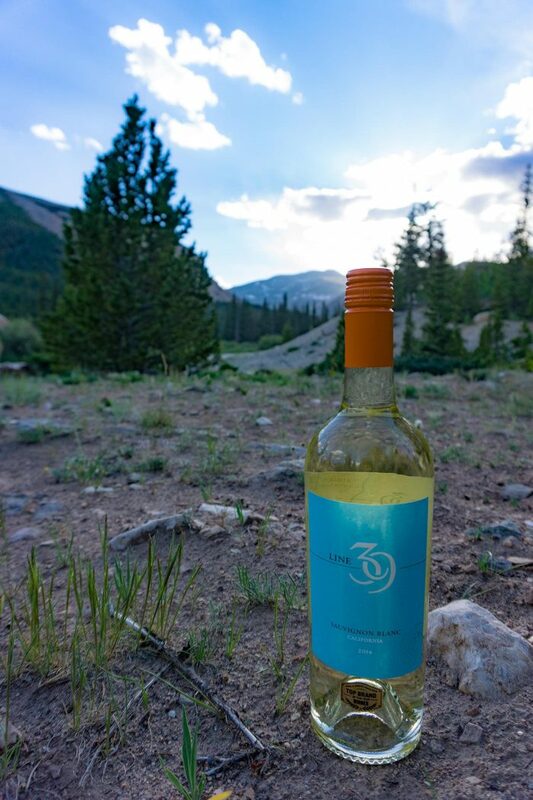 Line 39 Sauvignon Blanc – Summer in Colorado is hot, hot, hot! To cool off after a day of hiking I prefer a nice crisp white and Line 39 Sauvignon Blanc really hits the spot. Plus, it comes with a screw top cap! 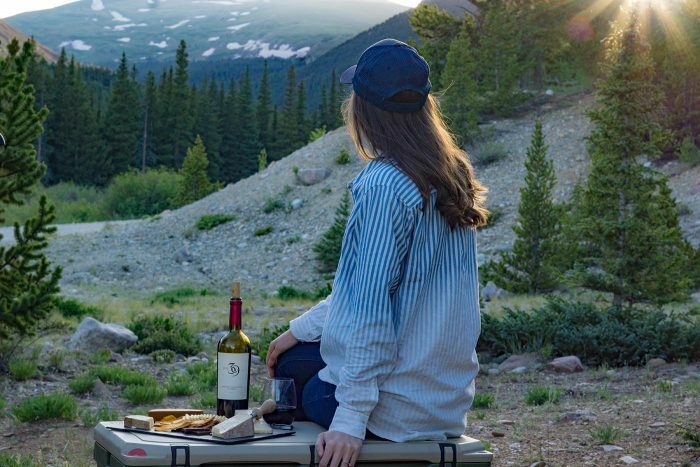 Nothing, and I mean nothing is worse than being stuck at a campsite with a big cheese plate, dinner on the grill and a nice bottle of wine that you can’t open! Line 39 Cabernet Sauvignon – When it’s time to bundle up around the fire I trade my white wine in for the smooth red of Line 39 Cabernet Sauvignon. The fruit flavors and hints of dark chocolate pair perfectly with my favorite sharp cheeses too. 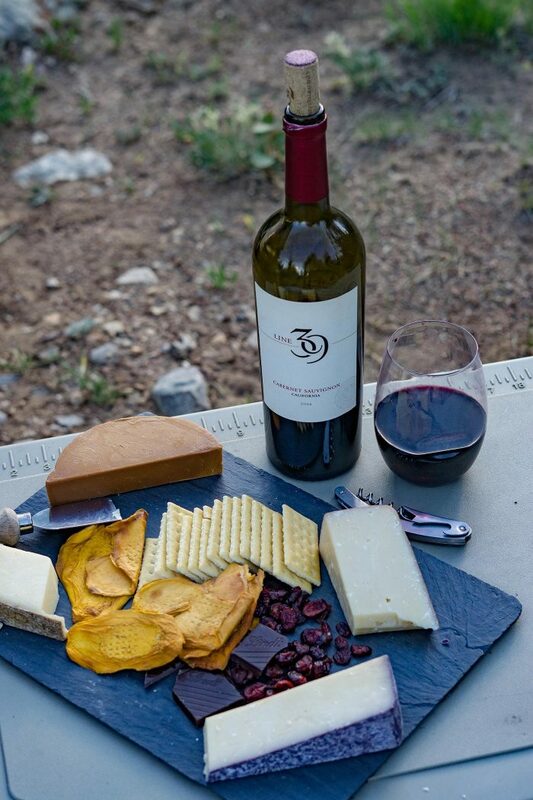 A glass of Line 39 Cabernet Sauvignon with some of my favorite cheese, a piece of dark chocolate and a little bit of fig jam… I am in camping heaven! Nothing screams camping like burnt hot dogs! So after years of burnt hot dogs, I was determined to elevate our camping meals. We organized our kitchen into one box, bought a cast iron skillet and bit the bullet on a nicer bear proof cooler that keeps everything ice cold. Now when it comes to actually cooking you have a few options: open flame – perfect for burnt hot dogs cook on “Grandpa’s Fork” or using a grated fire ring found at most designated campgrounds. 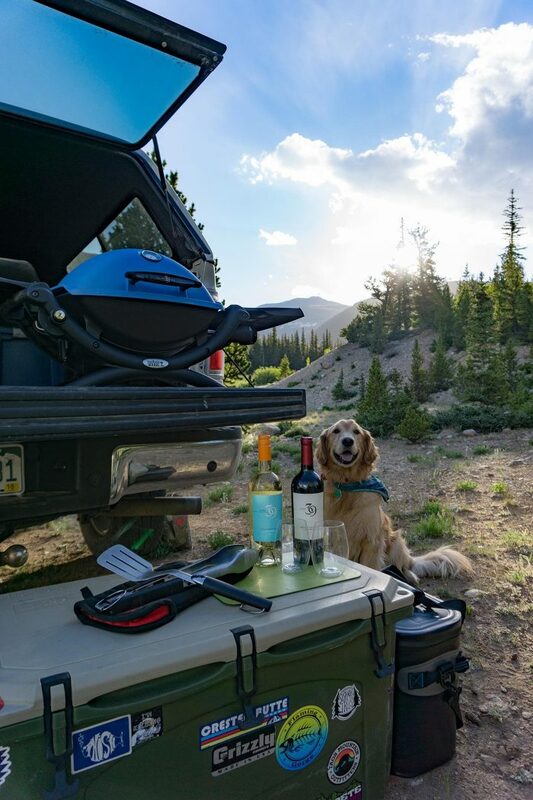 But for car camping down dirt roads with no neighbors and that spectacular view – you are going to need to bring a portable grill, a metal table for your grill (a truck bed works too), propane tank and the grilling essential utensils – oven mitt, scraper, and spatula. Thanks to Line 39 Wines we got a grill upgrade this summer to a Weber® Q®1200 portable grill! This blue beauty will take our campsite cooking to the next level. With built-in folding side tables, lid thermometer and cast-iron cooking grates we will now be eating perfectly grilled steak and veggies in no time. So long grandpa’s fork! 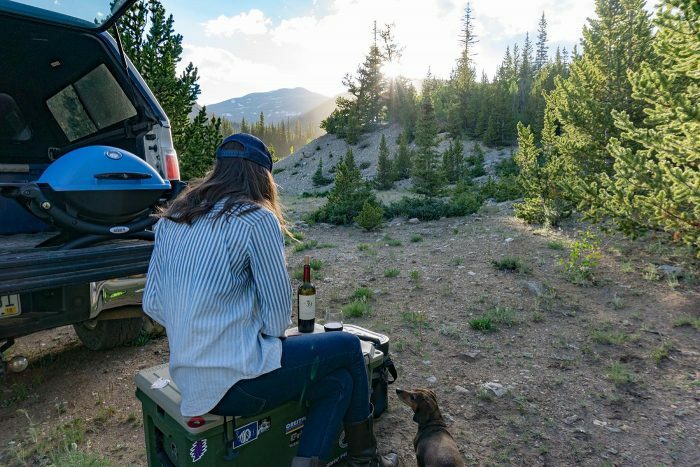 Now that you know the tenets of a perfect car camping set up, it’s time to load up the car and head off on your own car camping adventure. Lucky for you, Line 39 is teaming up with Weber® Grills for a fun summer sweepstakes! Visit line39bbq.com or text BBQ to 797979 for your chance to win a Weber® Q®1200 portable gas grill for all your outdoor adventures and backyard barbeques. See line39wines.com/sweeps for official rules and look for displays in store. Thanks again to Line 39 for sponsoring this post and our camping adventures! I’d love to hear your car camping tenet too – DM me or comment below! 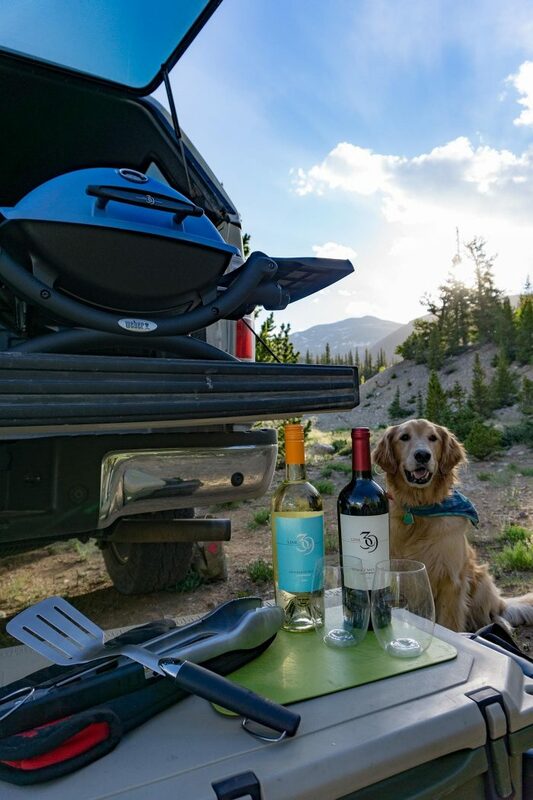 Car Camping Essentials for Camping in “Luxury” Channing & The Cheese Plate Event at New World Cheese National Cheese Lovers Day How To Throw A Camping Engagement Party The 5 Calorie Marg with Stirrings + Giveaway!